Greenpeace to GE: "Your Business = My Risk"
Nothing has really changed after the nuclear accident on March 11, 2011. 2 to 3 months after the March 11, 2011 disaster, just when the extent of radiation contamination became known - sewer sludge, ashes from garbage incineration exceeding 8,000 becquerels/kg - some people and organizations started the events of "beyond-nuclear" demonstrations, with celebrities and activists on stage telling the audience how they oppose nuclear energy. It was not really about Fukushima or the residents of Fukushima, not really about radiation contamination and what to do with it; it was this beautiful concept of life without nuclear power. Then-LDP Secretary General and current Minister of the Environment and son of Shintaro Ishihara called "beyond-nuclear" movement a "mass hysteria" in June 2011. I didn't think much of the moniker, "beyond-nuclear" or datsu genpatsu 脱原発, from the beginning. About a year later, starting in March 2012, a group started the protest in front of the prime minister's office to oppose the restart of nuclear power plants. It's a "single issue" movement, the organizers said. The Friday protests were extensively covered by independent journalist Yasumi Iwakami. The movement fizzled after the organizers met with then-Prime Minister Yoshihiko Noda, and disdainful remarks from the organizers for the protest participants drew criticisms. Meanwhile, food contaminated with radioactive cesium continued to be sold throughout Japan, so-called "hot spots" in Kanto and Tohoku regions remained mostly untouched, people continue to live in the contaminated middle-third of Fukushima Prefecture for one reason or another (job, children don't want to leave, etc. ), and people are returning to the more contaminated ocean-third of Fukushima as the government promises them extra compensation money if they return. There has been a curious lack of coverage even by the independent journalists of contaminated food and wide-area disposal of disaster debris. Two years later on March 10, 2013, people are still doing the same "beyond-nuclear" protest. It's certainly a lot of people. It is as if I were back in September 2011. I did like those local protests against particular politicians, though. The one against Yukio Edano in Saitama stood out. (Reuters) - The New York Stock Exchange is readying plans to be able to operate without human traders in case another disaster, such as Superstorm Sandy, forces the shutdown of its historic trading floor in downtown Manhattan, The Wall Street Journal reported. NYSE Euronext (NYX.N) is preparing to submit details of the plan to the U.S. Securities and Exchange Commission, according to the report, which cited people involved in the preparations. If activated, the plan would represent the first time the 221-year-old exchange would rely entirely on computer systems, without the oversight of floor-based traders, the paper said. A NYSE spokesman declined to comment on the report. The disaster plan would shift trading entirely to Arca, NYSE's all-electronic sister market. It would replace NYSE's current backup plan that calls for the exchange to remain open in a limited capacity while sending orders to Arca to be filled. Exchanges including Direct Edge Holdings LLC and BATS Global Markets Inc BATS.Z in the past year have moved to develop backup sites in Chicago, the paper said. Nasdaq OMX Group Inc (NDAQ.O) maintains a disaster recovery site in Ashburn, Virginia, and can run its U.S. markets from its European base in Stockholm. Superstorm Sandy forced the first weather-related multi-day shutdown of the U.S. stock market in more than 120 years when it struck the East Coast in October. If I remember right, Chris Noland was right there in Japan when the March 11, 2011 triple disaster struck. Seattle − February 12, 2013 – The lingering effects of the March 2011 Japanese earthquake, tsunami and Fukushima nuclear disasters are captured on film by Christopher Noland, a young American living and working in Tokyo during the catastrophic events. The only film of its kind takes an in-depth, critical look into how the Japanese government, and the Tokyo Electric Power Company© (TEPCO), managed the nuclear crisis and tsunami relief efforts, plus explore the future of nuclear power. “The film offers unique insights into a post-disaster present-day situation where millions of people are left to fend for themselves, and are blatantly told that a nuclear fall-out environment is safe.”. -Christopher Noland, Director, “3.11: Surviving Japan”. For those of you in the States who wants to go, the tickets are available online only. Visit the site 3.11.: Surviving Japan for details. #Fukushima Prefecture Promo Video: "Get Drunk on Fukushima - Fukushima Is Here, Unchanged, To This Day - Future for Fukushima"
All paid for by the country's taxpayers. The control screening tests for thyroid abnormalities in children is being carried out by the Ministry of the Environment in Hirosaki City in Aomori Prefecture (distance from Fukushima I Nuclear Power Plant about 420 kilometers), Kofu City in Yamanashi Prefecture (about 380 kilometers), and Nagasaki City in Nagasaki Prefecture (about 1,480 kilometers). The preliminary results have been announced by the Ministry of the Environment, and they more or less match the unofficial small-scale screening test results announced by doctors in Kobe City back in November 2012: Children in these far-away areas have higher incidents of nodules and cysts than children in Fukushima Prefecture. Aomori and Nagasaki hardly had fallout from the accident. Yamanashi had some fallout, but the numbers don't even compare to the prefectures in Kanto, or even to neighboring Shizuoka. For more on thyroid abnormalities in children, see this togetter if you read Japanese. It seems these thyroid "abnormalities" are quite normally occurring anywhere in Japan. That's not what many people in Japan and abroad want to hear. The conclusion for people in Japan who believe any bad news and rumors and disbelieves any non-bad news and rumors when it comes to radiation is either that the rest of Japan is so heavily contaminated by the Fukushima nuclear accident that children outside Fukushima have even higher incidents of thyroid abnormalities, or that the government is lying. The former doesn't make any scientific sense if they want to attribute these abnormalities singularly to the Fukushima nuclear accident (which they do), and the latter doesn't advance any understanding or discussion. But it doesn't seem to matter anyway. Radiation contamination has become almost like a religion, and since the national and local governments and government scientists did such a poor job of informing citizens of the nuclear accident and radiation contamination in the early days of the accident, people heavily discount anything they say or do. Knowledge hasn't advanced much, with the 2nd anniversary of the triple disaster of earthquake, tsunami and nuclear accident fast approaching. For that matter, recovery hasn't happened much either, other than the fake dead tree in Rikuzen Takata (which now has fake branches and leaves). Jiji Tsushin reports that Greenpeace activists covered the GE building in Brussels with posters that say "Your Business, My Risk", referring to GE's nuclear business. On March 7, in protest against General Electric, the US conglomerate who was involved in the manufacture of the reactors at Fukushima I Nuclear Power Plant, Greenpeace activists put up posters on the GE building in Brussels that said "Your business is our risk". Greenpeace released a statement on the same day that said "GE provided the main facilities for the Fukushima plant, but so far has been exempt from the responsibility for the damages. Many people in Japan haven't received proper compensations." The statement also emphasized that it was possible that an accident like Fukushima could occur in European countries that rely on nuclear power. There was a rumor for a very brief time right after the nuclear accident that then-Prime Minister Naoto Kan was considering suing GE for product liability. That rumor died very quickly. It has come to my attention that you have now asked an additional question: "Does the President have the authority to use a weaponized drone to kill an American not engaged in combat on American soil?" The answer to that question is no. Weekly Standard says everyone but Senator Paul himself have received the letter. Well I'm not. Because it is still the President who happens to be sitting at the White House who will decide what "combat" is. By the ever "wider" definition being adopted by this particular administration of what "terrorism" may mean, "combat" could mean a protest against the president's policy, or intention to protest. "If we let him/her, he/she might commit a terrorist act, so we preemptively eliminate him/her", or something along that line. And people will go "Oh.. OK... I guess you're right." Some media outlets like MSNBC reported on the filibuster with a disdain, but failed to mention Senator Paul is asking about the US drone attack INSIDE the United States. As if it is totally OK to use it outside the US. In Pakistan and Afghanistan, people were killed by the US military drones in their weddings and funerals. Are weddings and funerals "combat"? Well Rand Paul is not his father, that's for sure. (UPDATE) There seem to be at least three other Republican Senators doing the filibuster with Paul (Kentucky) - Jerry Moran (Kansas), Ted Cruz (Texas), and Mike Lee (Utah). They are doing the Questions and Answers routine among themselves, which is very intelligent and informative back-and-forth. This is very interesting. Now they're talking about Alamo and the Constitution. New face: Democratic Senator from Oregon Ron Wyden joined. He says he is in favor of Brennan, but he is dead set against the executive branch's unchecked power in target killings. Well-orchestrated filibuster, it looks like. C-SPAN is carrying it live. I wonder how long he can speak. I think he should also read books by Bastiat, von Mises, Rothbard, Hayek to his fellow Senators. That should last a day or two. He can read his father's books, too. According to the media, filibuster talk in the Senate doesn't happen very often, and it seems to have gotten more attention from the media than the letter Senator Paul received from Obama's Justice Department chief Eric Holder that it is legal to strike Americans with unmanned drones inside the United States, without trial, as long as the president thinks it necessary under "extraordinary circumstance". Sen. Rand Paul (R-Ky.) began speaking just before noon Wednesday on the Senate floor in opposition to the nomination of John Brennan to lead the CIA, saying that he planned to speak “for the next few hours” in a rare talking filibuster. Paul, who strongly opposes the Brennan nomination and the Obama administration’s use of unmanned aerial drones, becomes the first senator to make use of the procedural tactic in more than two years and the first to do so since the Senate approved a bipartisan rules reform package in January. Paul began his filibuster at 11:47 a.m. Eastern time. Around the one-hour mark, he acknowledged “I can’t talk forever” and said his throat was getting dry. At the start if the 1 p.m. hour, Paul was the only senator on the floor. Just 30 people watched from the Senate gallery above while a few security guards, stenographers and Senate pages held their appointed spots on the floor. In the rafters, a man responsible for operating the Senate television cameras was seen reading a newspaper. Paul’s comments from the Senate floor come as he’s raised objections in recent weeks. Paul first threatened to filibuster the Brennan nomination in late February, when he sent a letter to administration officials asking whether the U.S. government would ever use a drone strike to kill an American on U.S. soil. Attorney General Eric H. Holder Jr. responded to Paul’s inquiry Monday, saying the administration has “no intention” of carrying out drone strikes on suspected terrorists in the United States, but could use them in response to “an extraordinary circumstance” such as a major terrorist attack. Well, no one else seems to think so. "What's to worry, if you are not doing anything wrong?" people may say. Well, who's to decide what's "wrong"? No doubt the Obama White House is closely monitoring what and how the media reports on Paul's filibuster. LDP's Finance Minister (and Former Prime Minister) Taro Aso on Nuke Plant Policy: "The Government Made Them Do It"
Electric power companies in Japan, that is. Mr. Taro Aso, who is also the vice prime minister in the Abe administration, is very well known for his loose tongue since his days as the prime minister (September 2008 to September 2009). His "hurry up and die" remark in January this year is nothing new, as he said practically the same thing when he was the prime minister. He's not very good at prevaricating, like other Japanese politicians. Maybe his Roman Catholic faith keeps him honest, in a way. According to Jiji Tsushin article below, Aso apparently openly admitted that it was the national government who forced the electric power companies to go into the nuclear power business, as the national policy. Well, everyone knows that, but you're not supposed to say it. But Aso did, and it was newsworthy enough for Jiji. According to the minutes summary of the Council on Economic and Fiscal Policy meeting on February 28, which was disclosed on March 5 by the Cabinet Office, Mr. Taro Aso, vice prime minister and finance minister, referring to the [government's] energy policy, said "The national government definitely did make the electric power companies do the nuclear power plants." It is very rare for a minister to openly admit to the national government's responsibility in promoting nuclear power. Mr. Aso also touched on the shutdown of nuclear power plants after the Fukushima I Nuclear Power Plant, and said, "If we just turn around after the accident and pretend "it's all your (electric power companies') fault", they would be unhappy and say "It was you [the national government] who said it was safe"", speaking for the electric power companies. It sort of rhymes with the Jiji's interview with Dr. Antonino Zichichi, the 83-year-old Italian particle nuclear physicist who extolled the virtue of safe and cheap nuclear power, dismissing the Fukushima I Nuclear Power Plant accident as caused "human errors" committed by lowly non-specialist workers. President Obama's pick for the next Secretary of Energy is an MIT theoretical nuclear physicist who wrote in 2011 that it was a grave mistake for governments in the world to abandon nuclear power just because the Fukushima accident happened. And because Chinese, Indians, Russians, and South Koreans haven't stopped pursuing nuclear energy even after the Fukushima accident. So why should you? To address safety of nuclear power plants, he advocates the Small Modular Reactors (SMR), for which Babcock & Wilcox backed by Microsoft's Bill Gates won the federal government funding for half the cost of its 5-year project to design and commercialize small, modular reactors. And nuke waste? From what I've skimmed through he doesn't propose anything new. He simply says it has to be addressed. In the years following the major accidents at Three Mile Island in 1979 and Chernobyl in 1986, nuclear power fell out of favor, and some countries applied the brakes to their nuclear programs. In the last decade, however, it began experiencing something of a renaissance. Concerns about climate change and air pollution, as well as growing demand for electricity, led many governments to reconsider their aversion to nuclear power, which emits little carbon dioxide and had built up an impressive safety and reliability record. Some countries reversed their phaseouts of nuclear power, some extended the lifetimes of existing reactors, and many developed plans for new ones. Today, roughly 60 nuclear plants are under construction worldwide, which will add about 60,000 megawatts of generating capacity -- equivalent to a sixth of the world's current nuclear power capacity. But the movement lost momentum in March, when a 9.0-magnitude earthquake and the massive tsunami it triggered devastated Japan's Fukushima nuclear power plant. Three reactors were severely damaged, suffering at least partial fuel meltdowns and releasing radiation at a level only a few times less than Chernobyl. The event caused widespread public doubts about the safety of nuclear power to resurface. Germany announced an accelerated shutdown of its nuclear reactors, with broad public support, and Japan made a similar declaration, perhaps with less conviction. Their decisions were made easier thanks to the fact that electricity demand has flagged during the worldwide economic slowdown and the fact that global regulation to limit climate change seems less imminent now than it did a decade ago. In the United States, an already slow approach to new nuclear plants slowed even further in the face of an unanticipated abundance of natural gas. It would be a mistake, however, to let Fukushima cause governments to abandon nuclear power and its benefits. Electricity generation emits more carbon dioxide in the United States than does transportation or industry, and nuclear power is the largest source of carbon-free electricity in the country. Nuclear power generation is also relatively cheap, costing less than two cents per kilowatt-hour for operations, maintenance, and fuel. Even after the Fukushima disaster, China, which accounts for about 40 percent of current nuclear power plant construction, and India, Russia, and South Korea, which together account for another 40 percent, show no signs of backing away from their pushes for nuclear power. At least partial meltdowns? I think at the time of the publication it had been already fully admitted by TEPCO and the Japanese government that they were total meltdowns and partial melt-throughs (out of Reactor Pressure Vessels). As greenhouse gases accumulate in the atmosphere, finding ways to generate power cleanly, affordably, and reliably is becoming an even more pressing imperative. Nuclear power is not a silver bullet, but it is a partial solution that has proved workable on a large scale. Countries will need to pursue a combination of strategies to cut emissions, including reining in energy demand, replacing coal power plants with cleaner natural gas plants, and investing in new technologies such as renewable energy and carbon capture and sequestration. The government's role should be to help provide the private sector with a well-understood set of options, including nuclear power -- not to prescribe a desired market share for any specific technology. The United States must take a number of decisions to maintain and advance the option of nuclear energy. The NRC's initial reaction to the safety lessons of Fukushima must be translated into action; the public needs to be convinced that nuclear power is safe. Washington should stick to its plan of offering limited assistance for building several new nuclear reactors in this decade, sharing the lessons learned across the industry. It should step up its support for new technology, such as SMRs and advanced computer-modeling tools. And when it comes to waste management, the government needs to overhaul the current system and get serious about long-term storage. Local concerns about nuclear waste facilities are not going to magically disappear; they need to be addressed with a more adaptive, collaborative, and transparent waste program. These are not easy steps, and none of them will happen overnight. But each is needed to reduce uncertainty for the public, the energy companies, and investors. A more productive approach to developing nuclear power -- and confronting the mounting risks of climate change -- is long overdue. Further delay will only raise the stakes. Congrats, so-called "One Percent" in the US and the world. All the gains since the so-called "Lehman Crash" which may or may not have been engineered by the JPM and Hank Paulson (see Zero Hedge, here and here) have gone to you exclusively. The rest of us got double the unemployment, nearly double the food stamps between October 2007 and March 2013. The household disposable income has declined, gas price is 36% higher. "Mission Accomplished" - With CNBC now lost for countdown-able targets (though 20,000 is so close), we leave it to none other than Jim Cramer to sum up where we stand (oh and the following list of remarkable then-and-now macro, micro, and market variables): "we all know it's going to end badly, but in the meantime we can make some money" - ZH translation: "just make sure to sell ahead of everyone else." Ah good old October 2007. That was when Google was approaching the then-all-time high. I had a November call option of Google at $750. November came, and it was Nasdaq's multi-year high. Just when Google was about to breach $750, the stock and Nasdaq went haywire, for no apparent cause, taking the other indices with it. The stock market tried to recover in December, but when the Pakistani presidential candidate (Benazir Bhutto) died during her campaign the stock indices started the march downward again. They went down almost every day for the month of January 2008. Investor's Business Daily's IBD/TIPP Economic Optimism Index has plunged to a 15-month low of 42.2. The federal economic policies confidence gauge fell 11% to 35.5, also a 15-month low. Buoyed and encouraged by the rising stock market that correctly reflects the real market, no doubt, the federal government is giving away aids to Egypt and Pakistan, and hiring new employees. Mayor Baba of Namie-machi asked Google to film his town, so that the town's residents can see their neighborhoods and people in Japan and the world remember the Fukushima nuclear accident. The town looks just like as it was abandoned in the days after the March 11, 2011 earthquake and tsunami. 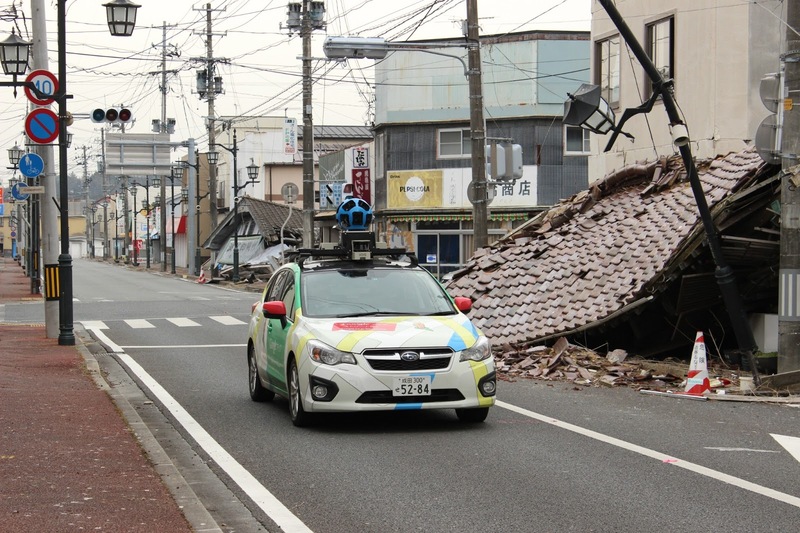 Today, Google will start capturing the Street View inside Namie-machi in Futaba-gun [district or county], Fukushima Prefecture. Currently, half of Namie-machi is in the "no entry zone" inside the 20 kilometer radius from Fukushima I Nuclear Power Plant, and the other half is designated as "planned evacuation zone". This time, we received the request from Namie-machi, and we will capture both zones inside Namie-machi for Google Map Street View. It will take several weeks to capture, and we are aiming at making it public in several months. I wonder if Google is going to measure radiation levels as they drive through Namie and capture images. I hope they do. Without that information, as one can't see radiation, Namie-machi's devastation is indistinguishable from other towns in Fukushima, Miyagi, Iwate that were destroyed by the earthquake and tsunami. Mayor Baba wants people to remember the nuclear accident and what it has done to his town and townsfolk. On March 12, 2011 morning, several hours before TEPCO did the vent on Reactor 1, the Fukushima prefectural government was sending personnel to measure radiation levels in Futaba-gun. I think it is total BS that the governor of Fukushima insisted he and his government weren't informed of any trouble at the　nuclear plants (Fukushima I and II). They were measuring from 8AM that day in the areas surrounding both plants. Unlike Okuma-machi and Futaba-machi, Namie-machi was not told immediately to evacuate. Namie was not on the TEPCO's list to fax nuclear emergency information (the list only contained the municipalities where the plants were located - Okuma, Futaba, and Tomioka). People took time, without knowing the radiation that was already spreading. Some were taking shelters in a location they thought was safe, but it turned out that they were living in a place with 330 microsieverts/hour radiation (Akougi District in Namie-machi, according to Ministry of Education). They didn't know it, until the NHK TV crew with Shinzo Kimura came and told them about the high radiation level (Kimura measured 80 microsieverts/hour just outside the house) on March 28, 2011. Just outside the house, Kimura measured the soil. Radioactive cesium (134+137) was 4 million becquerels/kg, iodine-131 was 23.2 million becquerels/kg. Mayor Baba remains bitter, and we can't blame him. Italian Physicist Antonino Zichichi: "Nuclear Technology Is the Safest Technology That Exists, Anti-Nuclear Movement Is Meaningless"
and the Fukushima I Nuclear Power Plant accident happened because of human errors. Italian nuclear physicist Antonino Zichichi was interviewed by Jiji Tsushin in February at CERN in Geneva, Switzerland. Two years since the disaster: Italian nuclear physicist says anti-nuclear movement is "meaningless", focus on safety measures and eliminate human errors. Dr. Antonino Zichichi (age 83), one of the most prominent particle and nuclear physicists in Italy and professor emeritus at University of Bologna, spoke with Jiji Tsushin. Dr. Zichichi said the nuclear technology was "the safest human invention", and declared anti-nuclear movement was "totally meaningless". According to his understanding, the Fukushima I Nuclear Power Plant accident was caused by human errors, and safety measures developed by knowledgeable experts would be indispensable. On nuclear energy, Dr. Zichichi said, "Suppose we could buy one sandwich with one euro, using the conventional technology. (Using nuclear energy,) we could buy one million sandwiches [with one euro]", emphasizing the utility value of nuclear energy as an efficient source of energy while renewable energy hasn't been established as superior energy. He asserted that "it is because of contribution of nuclear energy that the world population of 7 billion can live the way they live now". He said it would be "impossible" to maintain the current standard of living without relying on nuclear energy, and was critical of the movement away from nuclear energy in Germany and Switzerland and other parts of Europe after the Fukushima I Nuclear Power Plant accident. As to the safety measures for nuclear power plants, nuclear accidents such as the US Three Mile Island accident were caused by mistakes of workers who did not possess knowledge, he said. He emphasized that it would be possible to enhance safety infinitely but that we should recognize where human error could occur. Nuclear technology, he said, "needs to be managed by scientists with high levels of special knowledge". I wonder if Jiji's reporter dared (or bothered) to ask him about nuclear waste management and disaster cleanup cost. I suppose not. His strange calculation of 1 euro one sandwich doesn't make any sense to me. And to have him say that the nuclear accidents are caused by lowly workers not scientists. If anything, lowly workers are the ones who intimately know how a plant works and has technical knowledge and expertise, and that was the case in Fukushima I Nuclear Power Plant. A renowned nuclear scientist who happened to be the chairman of the Nuclear Safety Commission at the time of the accident panicked, and admitted nearly one year later that he couldn't sleep and didn't even remember what was going on in the first week of the nuclear accident. I don't believe there is any technology that is immune to human errors, but to a nuclear physicist like him, errors are for mere mortals. If only people like him were in charge, there would be no accident. Mere mortal Italians showed infinite wisdom, in the eyes of many in the world, when they rejected the restart of nuclear projects in Italy in the national referendum in June 2011. They also showed wisdom as they booted out the unelected Goldman Sachs technocrat from their government. Mayor of Osaka City in 2010 (Then Governor): "Learn How to Gamble from Early Age, Let's All Become Gamblers!" The boy-wonder mayor of Osaka City is getting really loose these days, after his party's sizeable win in the December Lower House election and a lot of national media attention has been given to him and his party since the election. The boy-wonder wants to build and run a casino in Osaka, and he has been preaching the virtue of gambling to the willing audience of national politicians for years now. On October 28, 2010, Governor of Osaka Toru Hashimoto attended the conference of the "Gambling & Gaming Society" which invited the Diet politicians who want to legalize casinos in Japan. Governor Hashimoto urged the politicians to legalize casinos by saying "By removing gambling from our daily lives, we have become a nation of the well-groomed and naive. We have to make an assiduous effort to master gambling from early age so that every Japanese citizen becomes a gambler. Please pass this Casino Bill." The conference of the Society was held at a hotel in Tokyo, attended by a non-partisan group of politicians in the National Diet called "Parliamentary Group for the Promotion of International Tourism Industry (Casino Group)". Kazunari Koga (DPJ), chairman of the group, said at the conference that he would like to submit the Casino Bill in the next year's ordinary session of the Diet. Governor Hashimoto wants to attract a resort facility that includes casinos in Osaka Prefecture. He said, "Casino, not tax increase. I will use part of the proceeds for education, welfare and medical care. I'll ignore if the governor of Hyogo Prefecture is against it. Everything that's vulgar, Osaka will take it." Early 2011 was not a good time for submitting the Casino Bill, with the Magnitude 9 earthquake and tsunami hitting Tohoku and eastern Japan in the middle of the ordinary session of the Diet. The boy-wonder himself submitted the bill on January 26, 2013. Even though he himself is not a Diet member, he is the co-chair of his Japan Restoration Party. What's important is to expand the economy, and casinos are the means. ... Unless it is a national project, there is no point in legalizing casinos in Japan. "National projects" in Japan used to be huge dams, nuclear power plants, infrastructure building for 1964 Tokyo Olympics, super-computers, mercantilistic policy supports for export industries. Now these politicians wants to make gambling a national project. Osaka has never been a refined place like Kyoto. It was a dynamic place of commerce for risk-taking, entrepreneurial merchants and industrialists who bet their own money and fortune. Now the boy-wonder wants to lead the nation by having a government-run gambling den in Osaka. Even in the Edo era with loose morals, gambling was prohibited. Some Osaka residents now firmly believe the boy-wonder wants to destroy Osaka. Here's one of the gambling stocks, Oizumi, from Nikkei Shinbun. The huge white candle in late January is when the Casino Bill was submitted by the boy-wonder. 50% jump in share price in less than one month. Not bad.